by Cambridge cosmologyst Stephen Hawking and Caltech physicist Leonard Mlodinow. "How can we understand the world in which we find ourselves? Over twenty years ago I wrote A Brief History of Time, to try to explain where the universe came from, and where it is going.But that book left some important questions unanswered. Why is there a universe--why is there something rather than nothing? Why do we exist?Why are the laws of nature what they are? Did the universe need a designer and creator?" "It was Einstein’s dream to discover the grand design of the universe, a single theory that explains everything. However, physicists in Einstein’s day hadn’t made enough progress in understanding the forces of nature for that to be a realistic goal. And by the time I had begun writing A Brief History of Time, there were still several key advances that had not yet been made that would prevent us from fulfilling Einstein’s dream. But in recent years the development of M-theory, the top-down approach to cosmology, and new observations such as those made by satellites like NASA’s COBE and WMAP, have brought us closer than ever to that single theory, and to being able to answer those deepest of questions. And so Leonard Mlodinow and I set out to write a sequel to A Brief History of Time to attempt to answer the Ultimate Question of Life, the Universe and Everything. The result is The Grand Design, the product of our four-year effort." "In The Grand Design we explain why, according to quantum theory, the cosmos does not have just a single existence, or history, but rather that every possible history of the universe exists simultaneously. We question the conventional concept of reality, posing instead a "model-dependent" theory of reality. We discuss how the laws of our particular universe are extraordinarily finely tuned so as to allow for our existence, and show why quantum theory predicts the multiverse--the idea that ours is just one of many universes that appeared spontaneously out of nothing, each with different laws of nature. And we assess M-Theory, an explanation of the laws governing the multiverse, and the only viable candidate for a complete "theory of everything." As we promise in our opening chapter, unlike the answer to the Ultimate Question of Life given in the Hitchhiker’s Guide to the Galaxy, the answer we provide in The Grand Design is not, simply, "42." A brief review by advanced reader "memoiai:"
"On the first page, I read the phrase ... 'Philosophy is dead.' ... reading onward, the authors made their point quite convincingly: philosophy is dead in the sense of answering the most mysterious of life's questions. It is up to science, and scientific theory, to provide clues to the true answers, as philosophy in its most ancient forms has taken a back seat, but modern philosophy, that of scientific philosophy, has taken root." Why is there something [rather than nothing]? Why this set of natural laws?" "The theories they expound upon are sometimes old, and sometimes groundbreakingly new, but all will either surprise you, educated you, or both; but in the least, make you think about reality and your own existence, and the reality of your existence. ..."
Those with scientific minds, will prosper with this book. Those that fear God, need not look away. This book does not disparage, criticize, nor impinge. It, as with all books, simply provides a story and its lessons." "The Early History of God: Yahweh and the Other Deities in Ancient Israel." "If you're looking for a 'History Channel' presentation for the general public, this isn't your book. But, if you're in need of a readable but stil extremely well-sourced, densely footnoted, and comprehensive history of the archaeology and textual evidence on the subject of the 'Yahwist Cult' and its interaction with other Canaanite religious cults, this is just what you need. It is most effective in showing how 'Yahweh' engulfed and devoured his competition, one by one, similar to the way in which the texts have him 'eating Death.' First he absorbed the cult of 'El,' the creator-sky god who was original 'King of the Elohim' or gods; and as we know, in the early books of the Old Testament God is as often called 'Elohim' (plural) as he is 'Yahweh.' Then 'Yahweh' absorbed elements of 'Baal' (the storm god and new King of the gods in Canaan), Baal's wife 'Anat,' El's wife 'Asherah,' and others.The point is that rather than 'God' being the death of evolution, it's clear from this book that 'Yahweh' is the product of centuries of conflict, accomodation, borrowing, and above all evolution. A triumph of evidence and reason!" " This is one book on ancient Israel that actually delivers what its title promises. In "The Early History of God" Mark Smith systematically sifts through archaelogical and literary data from Bronze and Iron Age Palestine, the Mediterranean, and Mesopotamia to find the earliest evidence for YHWH, his cult, and his context. Chapters include discussions of YHWH and El, YHWH and Baal, Asherah and asherahs, cultic practices, such as communication with the dead and child sacrifice, at the sites where YHWH was worshiped, as well as a brief discussion of the beginnings of monotheism during the late monarchy. Refreshingly for me, Smith frames his argument on available evidence, not on wishful thinking, and the result is provocative and stimulating. The long introduction to this new edition covers the debate that has gone on since the book was originally published over ten years ago, and the extensive footnotes are a wealth of information on every side of the discussion. This is the kind of book that helps keep scholarship in good repute. Don't wait to read it!" A brief review by "zosimos:"
"The Early History of God" by Mark S. Smith traces the origins of the cult of Yahweh (YHWH) in ancient Israel based on archeological and textual material. Mark S. Smith focuses upon the rise of Yahweh and Israelite monotheism (monolatry) in ancient Israel. The cult of Yahweh is opposed to that of the cults of other Canaanite and Mesopotamian deities including El, Baal, and Asherah. Separate chapters are devoted to Yahweh and Baal and Yahweh and Asherah (an early Canaanite goddess, contrasted with YHWH). The origins of Yahweh are revealed in cultic practices as related to solar worship, family worship and cultic veneration of the dead ("feeding the dead" and "communing with the dead"), as well as with the asherah (symbolized by the sacred tree) and the moloch (MLK) sacrifice (a sacrifice of the children to appease the deity). The development of the Yahweh cult through the monarchic period and as mentioned in the prophets and exilic period is fully worked out. The book comes to reveal how Yahweh gained supremacy so as to be before all other deities (indeed, supreme deity and One as the Godhead of the entire universe). Whether the conclusions that are reached in this book can be trusted in the light of Holy Tradition is of course a different matter entirely. Nevertheless, the book is a useful look at the origins of Yahweh-supremacy within the religious millieu of ancient Israel (the ancient Near East) based on evidence from Stone Age and Iron Age material as well as from early textual (biblical) sources." 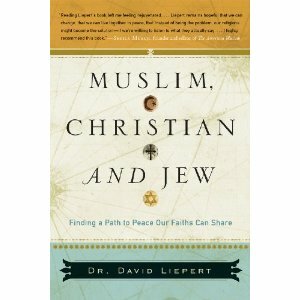 Dr. David Liepert has been active in multifaith relations for many years. He is vice president of the Faith of Life Network-- an internationally recognized Muslm organization dedicated to helping diverse communities live together. The list price is $30.00 US. Amazon.com sells it for $19.80 in hard copy Their Kindle edition costs $16.50. "Muslim, Christian and Jew: Finding a Path to Peace Our Faiths Can Share." "Virtually every other religious book portrays the act of believing-the decision a believer makes to accept that his or her own religion's particular assumptions and explanations are true-as if it is a good thing. Frankly, I think believing is dangerous. ... The thrust of my argument is simple: All of us think that our religion is "good" and that those in apparent (and often politically motivated) opposition to it are "bad." But the real truth is that all of our religions are equally guilty of being used to promote violence, and -- thanks to centuries of political manipulation that have distorted the way we read our holy books -- all of us are equally guilty of not following what our religions really say. ..."
"Do our different faiths only doom us to fighting with each other, or are they meant for something more? To find the right answers, you have to ask the right questions. Part II, "Beginning with Christianity," charts my journey of questioning from the very start. As I probed the history of the differences between Islam, Christianity and Judaism -- from cultural shifts to scriptural revisionism -- I came to understand the pressures that had forced these faiths so far apart, and I began to hope that they could find their way back together. In Part III, 'Into Islam,' I explore how Islam has gone from being a religion capable of sustaining a vibrant multicultural and multireligious civilization to the source of intolerance and conflict we have today. Part IV, 'Working with Judaism,' takes a close look at the path this faith has followed, from the first days of the Covenant to the conflict in the Middle East-driven by forces less religious than political-and posits a solution." "If we made politics, and we believe that God made us, shouldn't our faith lead our politics instead of the other way around? Part V, "Faith: The Solution," explores belief and human nature in a new light to explain how Freud's theories of the subconscious and quantum physics' model of the subatomic universe offer some of the best proof we have that God exists; show us a way to restore religion to its rightful role in our lives and our world; and conclude that we're all a lot closer to where we should be than we think." "This is what I find amazing about Liepert: On the face of it, he accepts conventional Muslim explanations of problematic aspects of the religion, but in the very next sentence, he will put a radical spin on things." Andrea Useem, The Religionwriter Blog. "Dr. David is a brilliant new North American Muslim voice. He has put much work into his tireless efforts, building bridges between our faiths and civilizations. I hope this work will be another step towards that vision." Imam Hamid Slimi, Chair of the Canadian Council of Imams. "Toward a true kinship of faiths." "No country, no culture, no person today is untouched by what happens in the rest of the world. Technological innovation, environmental degradation, economic gain & loss, nuclear weapons, instant communication have all created unprecedented familiarity among the world’s many cultures. With this historic development, the Dalai Lama understands that the essential task of humanity in the 21st Century is to cultivate peaceful coexistence. Many believe in the inevitability of an escalating “clash of civilizations”. Peaceful coexistence has long been problematic with religion, and while previous conflicts over religious differences may have been significant and regrettable, they did not threaten the very survival of humanity. Now, when extremists can persuade followers with the immense emotional power of faith and have access to powerful technological resources, a single spark could ignite a powder keg of frightening proportions. Yet the Dalai Lama shows how the challenges of globalization can also move us in another direction, to a deeper plane where nations, cultures, and individuals connect through their shared human nature. All major religions confront the same perennial questions; each have distinct forms of expression. But this marvelous diversity of insight has the potential for inspiring dialogue which can enrich everyone’s pursuit of wisdom. All faith traditions turn to compassion as a guiding principle for living a good life. It is the task of all people with an aspiration to spiritual perfection to affirm the fundamental value of the compassion. In this way we can truly develop a deep recognition of the value of other faiths, and on that basis, we can cultivate genuine respect. 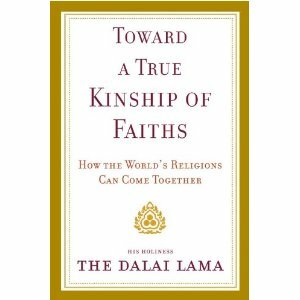 In Toward a True Kinship of Faiths, the Dalai Lama also explores where differences between religions can be genuinely appreciated without serving as a source of conflict. The establishment of genuine harmony is not dependent upon accepting that all religions are fundamentally the same or that they lead to the same place. Many fear that recognizing the value of another faith is incompatible with having devotion to the truth of one’s own. Nevertheless, the Dalai Lama profoundly shows how a sincere believer can, with integrity, be a pluralist in relation to other religions without compromising commitment to the essence of the doctrinal teachings of their own faith. An issue of central importance for the Dalai Lama personally and for the entire world in general, Toward a True Kinship of Faiths offers a hopeful yet realistic look at how humanity must step into the future." His Holiness the Dalai Lama is the spiritual and temporal leader of the Tibetan people. He is a recipient of the Raoul Wallenberg Congressional Human Rights Award, the Albert Schweitzer Humanitarian Award, and the Nobel Peace Prize. He lives in Dharamsala, India. The list price is $25.00 US. Amazon.com sells it for $16.50 in hard copy or $9.99 in their Kindle edition. "Religious intolerance in America: A documented history." American narratives often celebrate the nation's rich heritage of religious freedom. There is, however, a less told and often ignored part of the story: the ways that intolerance and cultures of hate have manifested themselves within American religious history and culture. 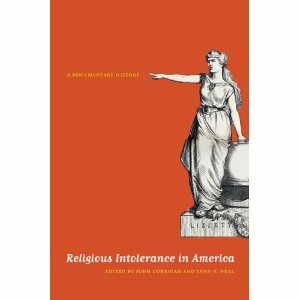 In the first ever documentary survey of religious intolerance from the colonial era to the present, volume editors John Corrigan and Lynn S. Neal define religious intolerance and explore its history and manifestations, including hate speech, discrimination, incarceration, expulsion, and violence. Organized thematically, the volume combines the editors' discussion with more than 150 striking primary texts and pictures that document intolerance toward a variety of religious traditions. Moving from anti-Catholic Ku Klux Klan propaganda to mob attacks on Mormons, the lynching of Leo Frank, the kidnapping of "cult" members, and many other episodes, the volume concludes with a chapter addressing the changing face of religious intolerance in the twenty-first century, with examples of how the problem continues to this day. In the first ever documentary survey of religious intolerance from the colonial era to the present, editors Corrigan and Neal define religious intolerance and explore its history and manifestations, including hate speech, discrimination, incarceration, expulsion, and violence. Organized thematically, the volume combines the editors' discussion with more than 150 primary texts and pictures that document intolerance toward a variety of religious traditions, from anti-Catholic Ku Klux Klan propaganda to mob attacks on Mormons, the lynching of Leo Frank, the kidnapping of "cult" members, and more. John Corrigan is the Lucius Moody Bristol Distinguished Professor at Florida State University, where he chairs the religion department. He is author or editor of many books on American religious history and coeditor of the journal Church History. Lynn S. Neal is assistant professor of religious studies at Wake Forest University and author of Romancing God: Evangelical Women and Inspirational Fiction (UNC Press). "A new history of early Christianity." Four Amazon.com customers gave this book a 5 star rating out of 5. "The relevance of Christianity is ashotly contested today as it has ever been. A New History of EarlyChristianity shows how our current debates are rooted in the manycontroversies surrounding the birth of the religion and the earliestattempts to resolve them. Charles Freeman’s meticulous historicalaccount of Christianity from its birth in Judaea in the first centuryA.D. to the emergence of Western and Eastern churches by A.D. 600reveals that it was a distinctive, vibrant, and incredibly diversemovement brought into order at the cost of intellectual and spiritualvitality. Against the conventional narrative of the inevitable “triumph”of a single distinct Christianity, Freeman shows that there was a hostof competing Christianities, many of which had as much claim toauthenticity as those that eventually dominated. Looking with fresh eyesat the historical record, Freeman explores the ambiguities andcontradictions that underlay Christian theology and the unavoidablecompromises enforced in the name of doctrine." Tracing the astonishingtransformation that the early Christian church underwent—from sporadicniches of Christian communities surviving in the wake of a horrificcrucifixion to sanctioned alliance with the state—Charles Freeman showshow freedom of thought was curtailed by the development of the conceptof faith. The imposition of "correct belief," religious uniformity, andan institutional framework that enforced orthodoxy were bothconsolidating and stifling. Uncovering the difficulties in establishingthe Christian church, he examines its relationship with Judaism,Gnosticism, Greek philosophy and Greco-Roman society, and he offersdramatic new accounts of Paul, the resurrection, and the church fathersand emperors. Title: "A new history of early Christianity." Cost: List price is $35.00. Amazon.com sells it for $23.10 plus postage Review / order it. It is also available in an ebook format for Kindles at $19.25 plus postage.